1. Cut away two walls of the carton, so that you have a square basin, a roof over it, and two poles one opposite the other to support the roof (see the photo). The roof supports must be wide enough to hold a spindle. 2. Make two holes, one opposite the other, in the roof supports to accommodate the spindle. 3. If you're making the spindle from a stick or pencil, cut out an oval piece of cardboard, it will take the handle. Glue that piece to the spindle so that together they form the letter "L", then attach the handle to the other side. 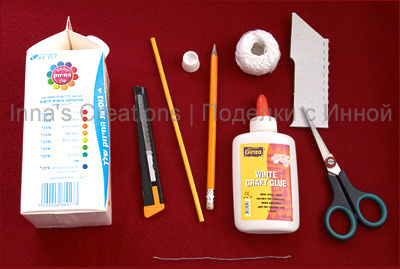 If the cardboard is thick enough, make openings in it to insert the pencil. 4. If you're using a cocktail straw to make the spindle, just bend it so that it's Z-shaped, with one horizontal section long enough to be put between the roof supports. The other two sections of "Z" will make the handle. 5. Insert the spindle into the openings in the roof supports. 6. Cut out a cardboard washer and glue it to the other end of the spindle. This will secure the spindle in place. 7. Make a bucket from a bottle cap, attach to it a wire handle. 8. Tie the bucket to a piece of thread and fix the other end of the thread around the spindle. 9. Stick some play dough to the bucket's bottom to make it sink. Way too cool, thanks for sharing! It's amazing! God bless you! I was looking for farm birhday party ideas and I found thanks! Thank you very much! I'm glad you found it useful. That's a great use for my little craft! Thank you, Sonia! Love your wishing well! Amazing love it. Just made in less than an hour. Using it for school bulletin board. We are raising money for Charity Waters. Thanks again. So beautiful...just wonderful and so simple!!!Bravooo!!! SUPERB IDEA SIMPLE BUT ITS LOOKING COOL WITH LESS EXPENSE. I remember doing this craft in school way back in the second grade and wanted to teach it to my kids. Thank you so much for posting it! Incredible!!! I can't wait to see my little ones' faces when they see the water!!!! !Thanks for sharing! Thanks for the creation , it was fun making it ,my son fees it was the best summer activity so far. Genial idea para representar una máquina simple: la polea! Mi pequeño de 1° grado te agradece tmb! 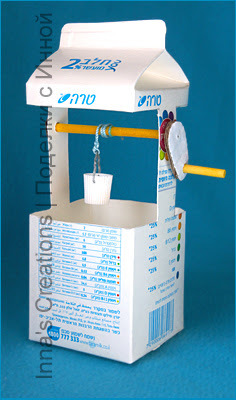 We made a larger version with large cereal boxes, a wooden dowel and a cup. This is the inspiration for a perfect 3rd grade simple machine project for my son!